Demonstrators carried megaphones and signs that said phrases like, “Too Little Too Latte,” and confronted the employees behind the register, according to NBC Philadelphia. Philadelphia Police Commissioner Richard Ross, who is black, said the men hadn't purchased anything and refused to leave, which led to the arrest. A video of the arrest and ensuing confusion went viral on Twitter. Michelle Saahene witnessed the entire event, as she’d been at the Starbucks for nearly an hour. She told NBC News on Sunday that, as a black woman, she was slightly nervous when the police officers entered the coffee shop, but she was then as shocked as the two men when they were approached by the members of law enforcement. After the two men were refused the bathroom, they just sat at a table silently and played with their phones as they waited for a friend, Saahene told NBC News. "The cops were asking them to leave because they weren’t purchasing anything," Saahene said. "[The two men] said they were confused. This is a Starbucks. Since when are people asked to leave a Starbucks who are just sitting there?" Saahene said that a white man sitting next to her had been at the Starbucks for 30 minutes without making a purchase and a jogger came in and used the bathroom without making a purchase. That’s one of the reasons she felt compelled to approach the employee who called 911. “I got to the other side of the Starbucks and yelled, ‘you’re a coward!’” Saahene added. "Creating an environment that is both safe and welcoming for everyone is paramount for every store," Johnson said. "Regretfully, our practices and training led to a bad outcome — the basis for the call to the Philadelphia police department was wrong. Our store manager never intended for these men to be arrested and this should never have escalated as it did." 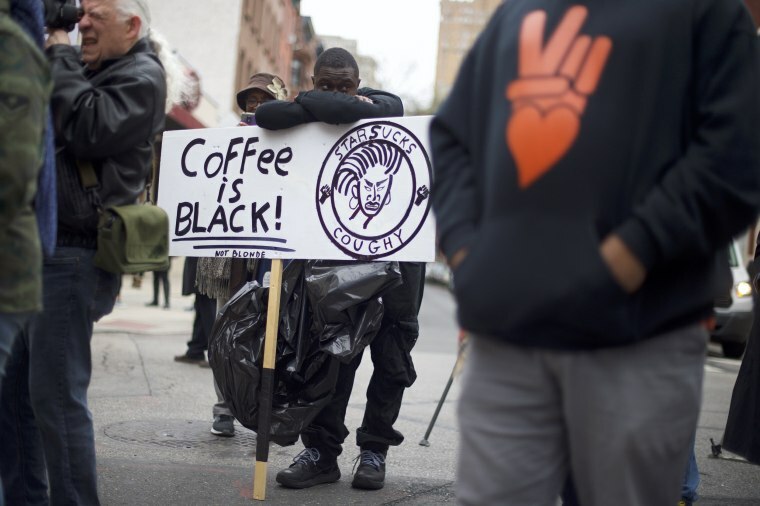 The arrest of 2 African-American men in a Philadelphia @Starbucks is deeply troubling. This event is not representative of how Starbucks operates. Kevin Johnson’s apology & actions are a good 1st step. An investigation will follow, and we should give them the time to do it. But many remained unhappy with the chain. Rather than taking to the streets, however, they shared their displeasure on social media. Saahene, meanwhile, said she was overwhelmed by the support she received from the multiple white women who stood with her and then walked out of the Starbucks with her. They helped bring attention to the injustice of the situation, she said. "That’s so important because for us to be successful we need those in the majority to take a stand," Saahene said. "We as minorities have been crying for help have been pushing for social justice, but it’s not going to get better until we have the majority standing up for us."